The family of the 85-year-old Palo Alto man who's been detained for more than a month in North Korea says he is being well fed and is getting his medication. Retired finance executive Merrill Newman's family released a statement late Saturday that said the Ambassador of Sweden was permitted to visit him Saturday at the Yanggakdo Hotel in Pyongyang. "As a result of the visit, we know that Merrill is in good health. He has received the medications that we sent him and medical personnel are checking on his health several times a day," the family statement said. It also said that he was being well treated and even reported that the food he was being feed was "good." "As you can imagine, we had been deeply worried about all of these things and today's consular visit has eased our concerns," the family statement read in part. The family's report came hours after North Korea state media released video showing Newman reading an apology for alleged crimes during the Korean War and for "hostile acts'' against the state during a recent trip. 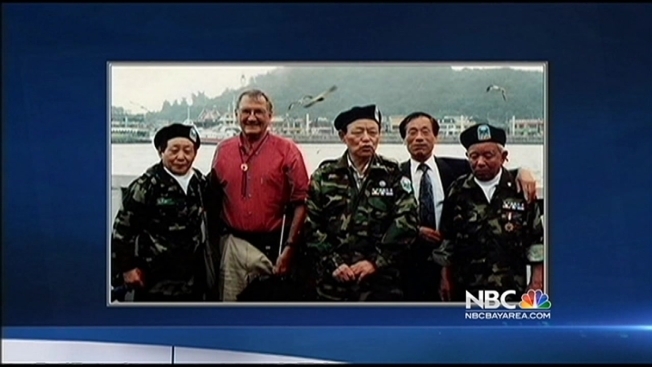 Newman, who fought in the Korean War, was taken off a plane Oct. 26 by North Korean authorities while preparing to leave after a 10-day visit. Also Saturday, the U.S. again urged North Korea to release Newman. National Security Council spokeswoman Caitlin Hayden says that given Newman's age and health-- he's on heart medication--North Korea should release him so he can be reunited with his family. Newman's traveling companion, neighbor and former Stanford University professor Bob Hamrdla, was allowed to depart. Newman's son, who lives in Southern California, has said his father wanted to return to the country where he spent three years during the war. We received a report from the State Department today that the Ambassador of Sweden in the DPRK was permitted to visit Merrill Newman on Saturday, November 30th, at the Yanggakdo Hotel in Pyongyang. We were very pleased to hear that the Ambassador was allowed to pay this first visit to Merrill. We want to thank the Swedish Ambassador and also express appreciation for the cooperation of the DPRK government in allowing the visit to take place. As a result of the visit, we know that Merrill is in good health. He has received the medications that we sent him and medical personnel are checking on his health several times a day. Merrill reports that he is being well treated and that the food is good. As you can imagine, we had been deeply worried about all of these things and today's consular visit has eased our concerns. Our focus now is on getting him home quickly to join his loved ones, who miss him deeply. We are asking that the DPRK authorities take into account his health and his age and, as an act of humanitarian compassion, allow him to depart immediately for home. All of us want this ordeal to end and for the 85 year-old head of our extended family to be with us once more. North Korea state media claims Newman apologized for alleged crimes during the war and for "hostile acts'' against the North during his trip. North Korea is extremely sensitive about any criticism and regularly accuses Washington and Seoul of seeking to overthrow its authoritarian system through various means _ claims the U.S. and South Korea dismiss. The State Department has repeatedly warned Americans about traveling to the country, citing the risk of arbitrary detention.